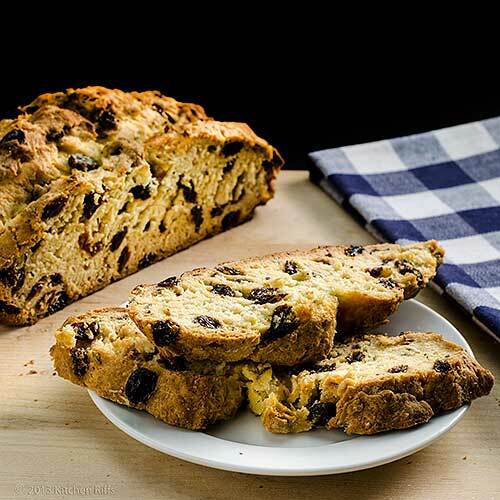 In the US, we tend to think of Irish Soda Bread around March 17th — Saint Patrick’s Day. The rest of the year? Not so much. Which is too bad, because it’s easy to make. Not to mention tasty. And its flavor blends well with the simplest meal or the fanciest dinner. In its original form, Irish Soda Bread was quite plain. But over the years, bakers have made additions to the recipe. Nowadays, you’ll see elaborate versions that include butter, eggs, and sugar. Even the plainest loaves sold in the US now commonly contain raisins (or currants) and caraway seeds. So today’s post is a twofer: We present both a simple version of Irish Soda Bread, and a more elaborate alternative. One of these is sure to appeal. But be warned: It’s tough to choose. You may decide to do what we did — and make both! Basic Irish Soda Bread contains flour, baking soda, salt, and buttermilk — and nothing else. Today, however, it’s the rare baker who doesn’t add some raisins and caraway seeds. Fancier versions use these, along with eggs, butter, sugar, and perhaps other ingredients. Some of these elaborate “breads” are almost cake-like. No matter how plain or fancy, every recipe for soda bread contains buttermilk. You can’t substitute sweet milk — the acidity of the buttermilk combines with baking soda to provide the leavening in this recipe. The best buttermilk is the kind you make yourself, as a byproduct of whipping your own Homemade Butter. Store-bought buttermilk is also readily available and of decent quality (though not as good as your own). We discuss buttermilk options in the Notes. Mrs. Kitchen Riffs has been experimenting with various soda bread recipes, and has found two that she likes quite well. The first is a relatively simple one that she adapted from The Gourmet Cookbook. It yields two 6-inch round loaves. Active prep time is about 15 minutes. Cooking time is 35 to 40 minutes, but you’ll want to let it cool for an hour or two before you slice it. So total time is 2 hours, maybe 3 tops. Well-wrapped leftovers keep for several days at room temperature. The second recipe makes a much richer, almost cake-like, soda bread. It’s adapted from the October 2002 issue of Bon Appétit. This recipe make one large 10- to 12-inch loaf (easily large enough for 10 or more servings). Prep time is about 15 minutes, baking time an hour and a quarter or so, and cooling time another hour or two. So total time is 2½ to 3½ hours. Again, well-wrapped leftovers keep for several days. Preheat oven to 375 degrees F. Place rack in center position of the oven. Place raisins in saucepan and add just enough water to cover; place over medium heat; once water comes to a light boil, turn down heat and let raisins simmer while you mix other ingredients. Prepare a baking sheet by first buttering it, then flouring it. Knock off excess flour. Measure 4 cups of flour into a medium bowl. Add the baking soda, salt, sugar, and caraway seeds. Whisk mixture thoroughly to combine (take a good minute). Drain the raisins and stir them into the mixture to combine. Then add the buttermilk. Stir until the dough just forms — the flour should be evenly moistened, but it’s OK if it’s still a bit lumpy. Turn the dough onto a floured surface, and knead just enough to form into a large ball (don’t overknead). Cut dough in half, and form each half into a ball. With your hands, shape each ball into a rounded disc measuring 6 inches or so across, and place both discs on the prepared baking sheet (allowing at least 4 inches between them). Using a sharp knife, cut a large X (cross) in each loaf, about 1 inch deep (this allows the bread to expand). Brush the loaves with melted butter. Bake until golden brown and done (about 35 to 40 minutes). What’s done? The bottoms will sound hollow when tapped, and an instant-read thermometer will show around 200 degrees F (a bit higher is OK). Allow to cool thoroughly on a rack before slicing (an hour or two). Preheat oven to 350 degrees F. Place rack in center of oven. 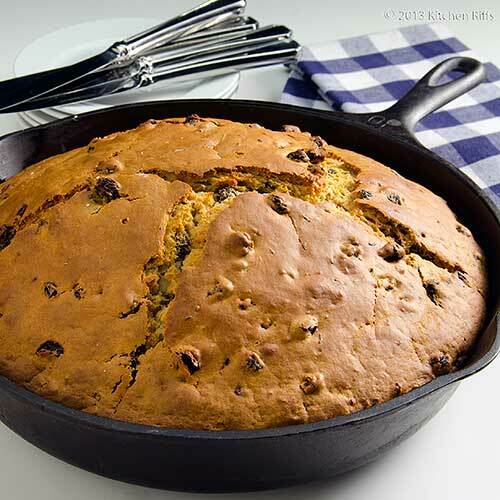 Butter a heavy, ovenproof skillet (cast iron is ideal) measuring 10 to 12 inches in diameter, with sides that are 2 or more inches high. In a large bowl, whisk together flour, sugar, baking powder, baking soda, salt, and caraway seeds. Cut the butter into cubes, and add to the flour mixture by using fingertips and rubbing until you form coarse crumbs. Drain the raisins and stir them into the mixture to combine. In a medium-sized bowl, mix the buttermilk and egg, then add them to the dough. Stir the dough (a wooden spoon works well) until the ingredients are thoroughly mixed (dough will be soft and sticky). Pour dough into the prepared skillet and smooth. Use a sharp knife to cut a 1-inch-deep X in the top of the dough (this allows the bread to expand). Bake until a knife inserted into the center comes out clean (about 1 hour 15 minutes). Cool bread in skillet for about 10 minutes. Then turn out onto a rack and allow to cool completely (an hour or two). You must use buttermilk in this recipe, because its acidity works with the baking soda to leaven the bread. Sweet milk won’t do this — the bread would be edible, but its texture would be unpleasant. The best buttermilk is a byproduct of making your own butter. This is a really easy process, and you can read about it in our post on Homemade Butter. In terms of flavor, the second best option is to enhance store-bought buttermilk with a process described by Alanna Kellogg in a post on one of her blogs, Kitchen Parade. Next in terms of quality is using plain store-bought buttermilk (although its flavor isn’t as good as it used to be). But many of us don’t use much buttermilk, so we hesitate to buy an entire container. In that case, I recommend using a powdered cultured buttermilk blend (the brand I use is Saco, and I can’t distinguish between it and plain store-bought buttermilk). If you use a powdered buttermilk, first determine how much powder you need to equal the amount of liquid buttermilk specified in the recipe (the container should provide clear information on equivalents). Add the buttermilk powder to the bowl with the other dry ingredients (Step 4 in the Procedure for both recipes), and whisk it in. Then add the necessary amount of water (again, follow the container), and the water will activate the powder, giving you buttermilk. Simple! If you don’t have buttermilk on hand in either liquid or powdered form, you can artificially “sour” sweet milk as a last resort (you’re actually making a form of clabbered milk). Usually, a tablespoon (or even less) of lemon juice or vinegar per cup of milk will do the trick. Or use about 1¾ tablespoons cream of tartar. Stir, and let the milk stand at room temperature for a few minutes before using. At Kitchen Riffs central, we like to make our own butter, so we often have home-made buttermilk on hand. Otherwise, we keep a can of Saco buttermilk powder in the pantry — it’s good quality and convenient (and no, we have no connection with this company – we just like this product). BTW, some soda bread recipes replace buttermilk with yogurt (its acidity works with baking soda). But IMO, the buttermilk recipes are superior. 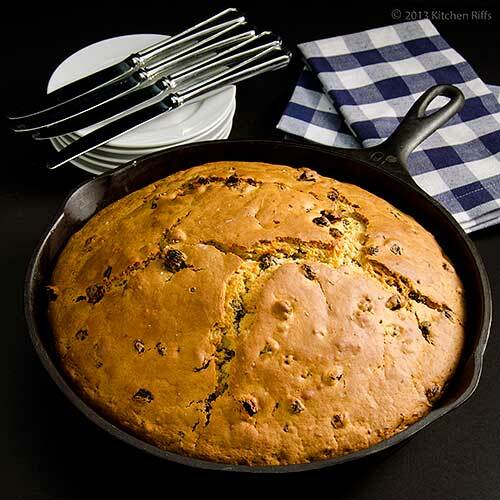 Both of our recipes direct you to simmer the raisins before adding them to the bread dough. Mrs. Kitchen Riffs always does this, and she doesn’t recommend skipping this step. Simmering plumps and softens raisins (which otherwise can be hard and dry). It really does make a difference. She learned this trick years ago in a cookbook (she’s forgotten which one) by the great Maida Heatter, and has used it ever since. Soda bread is made in many countries around the world, not just Ireland. It became popular in the 19th century when commercial bicarbonate of soda — a/k/a baking soda — became widely available. Before that time, soda breads were often made with pot ash (derived from plant ashes soaked in water). This method is centuries old. The first recipe above directs you to use a baking sheet. But you can also make one or both loaves in a skillet. Just grease the skillet with some butter, and place the disc of dough onto it. The first (simple) recipe produces a bread that’s denser and has more surface texture than the second (fancy) version. The second version rises more and its texture is lighter and fluffier. In fact, it rises enough that it’s fairly hard to see the X on the top after baking. The first, second, and fourth photos show the first recipe; the third and last photo show the second. So, Which Recipe is Better? “I guess I am a pretty enthusiastic eater,” I agreed, reaching for another round from each batch. I needed to do a thorough, impartial taste test, after all. “Uh, right,” I said, pulling my hand back. I guess I’ll have to cut my taste-testing short. I think I ate it for every meal. Hi Fawn, isn't Irish Soda Bread delish? I can well imagine you having it for every meal. Thanks for the comment. Just gorgeous! Your photos are always so inviting. Wonderful looking bread!! Now this is a bread that even I might try baking. I don't know that I've ever had Irish Soda Bread so this is going to the top of my must-make list, thanks! I loved teh second version, since it is sweet :). Also liked the yellow skillet, the color combination of the bread in the yellow skillet is neat. Thank you for all these recipes!! I have never done soda bread myself, thought it's complicated... But your recipe sounds eay; so this time (on the weekend), I will go ahead with it and surprise my family. Have a great St Patrick day! Hi Kristi, this was fun to make, even more fun to eat! Thanks for the kind words, and comment. Hi Kristy, this is dead easy to make - pretty close to no worries. Enjoy! Thanks for the comment. Hi Shibi, the second version is kind of like coffee cake, though a bit more savory. Really nice. Glad you liked the yellow skillet. ;-) Thanks for the comment. Hi Uru, it actually is pretty simple. ;-) Thanks for the comment. Hi La Torontoise, this is, IMO, an extremely easy recipe - and it's not only fun to make, it's wonderful to eat. Happy St. Pat's Day to you, and thanks for the comment. What a gorgeous bread! I bet it tastes awesome delicious! Hi Peachy, it's really good stuff! Something we'll definitely be making more often than just for St. Pat's. ;-) Thanks for the comment. Man, you have got your Irish on and it is lookin'good! Which bread is in the second picture? That is over the top gorgeous! And will it just be raisin bread if I leave out the caraway? I don't like caraway. What the heck? I love raisin bread! Hi Abbe, the second picture is the first recipe (the simpler of the two). You can certainly leave out the caraway seeds - the first Irish Soda Bread didn't include them! They do taste good, but if you don't like them, well, then they won't taste good to you! 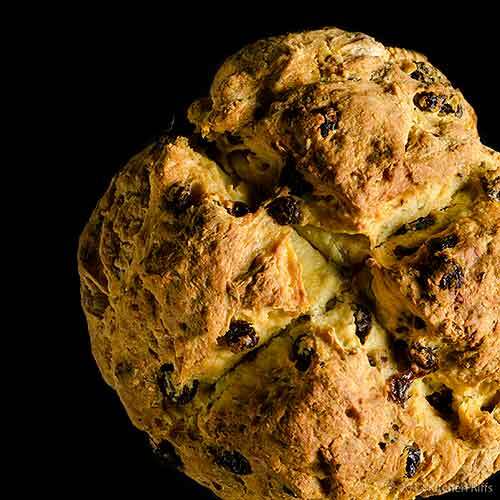 So just make a raisin-heavy Irish Soda Bread, and tell anyone who asks that's how you like it. ;-) Thanks for the comment. Looks like a really gorgeous bread but I have actually never tried Irish Soda Bread before! Maybe my mother and I will tackle this recipe over the weekend as she loves trying new bread recipes out, and plus it is St. Pattys! I have never made or eaten Irish soda bread. Both versions look really tasty. I need to keep this recipe handy for when the bread craving strikes but I've run out of yeast. Love your recipe, thanks for sharing! Hi Marta, the sweet version would be particularly good for breakfast! Loads of goodies in it. ;-) Thanks for the comment. Hi Natalie, this is perfect for the weekend! And a great way to celebrate St. Pat's. Thanks for the comment. Hi Dawn, you really owe it to yourself to try this sometime - it's totally tasty. ;-) Thanks for the comment. Hi Nancy, good thing about this, of course, is you don't need yeast - just baking soda. So you can make it when you get those bread munchies. Thanks for the comment. Thank you for so diligently baking and eating two versions of soda bread! That really is going over and way beyond the call of duty!! Love your deliberations afterwards too! I like the look of #2 best! I'm going to give Pie in the Sky's soda bread a try at the weekend, baking at 5280ft can be hit or miss with regular recipes! Your bread looks so much better than the ones I've seen advertised in papers these days! I have made this a couple of times but mine was good the first day but seemed a bit dry the next. Yours look fantastic and seem they could last a few days without any problems. I want to try your second recipe, I like cakey things, and with some tea, sounds wonderful! I love the look of that bread. That sort of bread with dried fruit was always a big favourite before my latest discovery and now I can't touch it. It's funny how you can love foods that hurt you. I am sure you and your wife thoroughly enjoyed it. Hi Carolyn, fancy is good. ;-) And I'm not surprised at all to learn that's your choice! Thanks for the comment. Hi Sally, one does have to be diligent and self-sacrificing when one has a blog, doesn't one? ;-) Baking at altitude is definitely a challenge, so you're right that it's a good idea to go with tested recipes. Thanks for the comment. Hi John, we do give, give give, don't we? ;-) You'll like the second version. They're both good, but that's towards the dessert end, and certainly a bit richer. Thanks for the comment. Hi Nazneen, if you wrap it really well it should keep for a day or a bit longer. The second one, in particular, keeps reasonably well, so since that's the one you want to try anyway, I think you'll be fine. Thanks for the comment. Hi Suzanne, we really did enjoy both breads, and I'm sorry that you have to avoid it. But you're such a creative cook, maybe you'll figure out a recipe that works for you (within limitations, of course). Thanks for the comment. Hi Alyssa, good as this is with a dinner, I think it's even better with breakfast. Thanks for the comment. Mmmm ~ I recently made some Irish Soda Bread but yours is much prettier ... By the way, would you be interested in joining my food tribe on triberr? Hi CJ, soda bread is nice, isn't it? Thanks for the kind words, and comment, and I definitely need to look into triberr - sounds like fun. You are so right! It definitely is going to be hard to choose. I've never made Irish Soda Bread before but since I'm making my own bread again, I now have the inspiration to make this. Thank you! I had no idea that it used so many raisins and that's a good thing! Thanks to Mrs. KR for finding these two recipes and to both of you for all of the great kitchen notes. As always - they are great! Happy St. Patrick's Day! Beautiful bread! I love the rustic look of it. And you're right; I look for soda bread recipes only around St. Patrick's day. :-) I don't know why, since they taste so good! Thank you for sharing the recipe. Hi MJ, you should probably make them both. And the raisins are great! Some people don't include them in soda bread, but they go really well. Happy St. Pat's, and thanks for the comment. Hi cHow Divine, isn't it nice looking? And it's so weird that we only eat this bread once a year, because it's so good. Too much other stuff to make, I guess. Thanks for the comment. I think I'd like to try bread #2 loaded with everything. It looks delicious. I try to stay away from the carbs but it sure is difficult when there are so many beauties posted online. I have never made soda bread and now that I think of it I don't know why I have not! I love baking and both versions look tempting to me. Decisions, decisions, they both look fantastic! I've not eaten a great deal of soda bread, only in Irish pubs (which makes sense!) Both look delicious, but I think I would prefer the "more like bread" one that would go perfectly with corned beef! Yum! Hi Vicki, the second one is certainly tempting! Of course the first one is, too! Very similar in concept but the flavors and textures are different. Thanks for the comment. Hi Sawsan, it's so easy to make! You'll love it. The caraway seeds really add a lot of flavor, so they're worth getting IMO. Thanks for the comment. Hi Rosa, isn't this nice? We actually do make all of our own yeast bread, but this is such a nice change, and perfect when you want something hot from the oven. Thanks for the comment. Hi Chris, I know, tough to decide, isn't it? ;-) Thanks for the comment. Hi Ali, about 80% of the time I'd choose the first one (if I had to choose!) simply because it's more bready. Lucky I don't have to choose! Thanks for the comment. Hi Ray, both breads are so good, it just comes down to what qualities you prefer. Of course if you're Mrs K R, you'll ending up making both! I hope you have a great weekend too, and thanks for the comment. Dang it, I've been dreaming about Irish Soda Bread all week! I'm just going to have to break down and make some, I guess. Looks delicious! Hi Jen, time to make your dreams a reality! Good thing making this takes only a few minutes. ;-) Thanks for the comment. I love Irish Soda bread and have never prepared it. Yours looks superb. Both have their own originality that looks delicious. I love the use of skillets. Something else I don't do enough of. And a big yummy for the Irish coffee!! I am chuckling so hard right now my face hurts. Not because of anything you said, but of my memory about 20 years ago making my first batch of irish bread. Lets just say things did not work out as planned. I used my irish bread as a door stop to let the spring breezes pass by. I don't where it all went wrong for me but I am sure with all of your helpful hints I will be on the road to success with my next attempt. 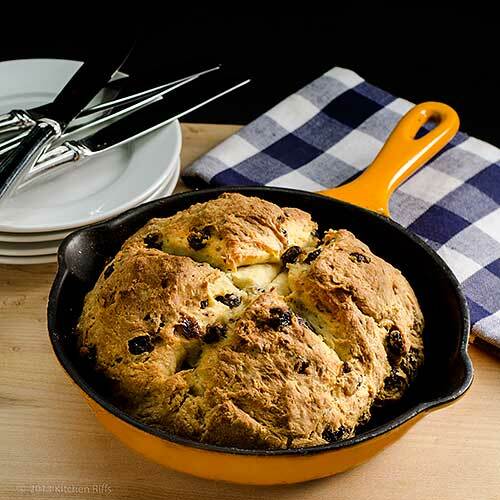 Your Irish Soda Bread looks picture perfect. I know, we seldom make this wonderful bread besides St. Patrick's Day...that's just sad. I love that you add caraway seeds in it. The flavor must be wonderful. :) Thanks for sharing and have a wonderful weekend. Hi Judy, it's a fun recipe, and of course so seasonal. Thanks for your kind words on this (and Irish Coffee), and of course for your comment. Hi Bam, I can see where this could become a door stop! But not with this recipe. ;-) Your next attempt will work, trust me. Thanks for the comment. Hi Amy, the caraway seeds add so much interest! Truly excellent. And I know what you mean about not making things like Irish Soda Bread enough - it's too good to make only once a year. Thanks for the comment. For some reason I've never tried soda bread, but would love a slice of the cake like one! Hi Gorumantine, it's really good stuff - well worth making. Hope you get to taste some someday! Thanks for the comment. Mmmm....thanks for reminding me that I'm way overdue to make some soda bread. My family likes it very basic, but it's still so darn tasty! Your photos are marvelous, John! Hi Liz, you're welcome. ;-) Good stuff, isn't it? Thanks for the kind words, and the comment. I like anything that can be baked right in the skillet and this looks like no exception! You're right that we tend to not think about Irish Soda Bread year-round...thanks for reminding me! Hi Erina, it's fun baking in a skillet, isn't it? Plus the presentation is so nice! Thanks for the comment. Lovely looking bread! I like the fancy version better! It's interesting that you used a skillet to make this bread, because in my most recent recipe I also used a skillet to make a dessert. It certainly is fun baking in a skillet, presentation is really great! Perfect to see this on St. Patrick's Day. :) I love the bread and the photos. You two are a magic duo. Hi Julia, isn't this nice? I really like both recipes, but the fancy does have more flavor than the simple one. Skillets are great for making flat breads like these! Thanks for the comment. Hi Maureen, isn't this nice for St. Pat's? Best of all, the flavor is great on both of these! Thanks for the nice words, and the comment. Hi Helene, baking in the oven is correct. For one of the recipes (the second) you need to bake it in something like a skillet to give it shape. The skillet is optional for the first recipe, although I used it for one loaf (the recipe makes two loaves - I didn't use it for the second)simply because it looks so good! Both of these recipes are pretty good - I think you'll enjoy them. Thanks for the comment. I love, love, love soda bread and agree it can go with anything. Funnily enough I've always had the simple straightforward version though, I've never tried the raisin/caraway version (and how have I missed that?) although it sounds delish! Hi Food Jaunts, the simplest version is quite good, but do try it sometime with raisins and caraway seeds - I'm betting you won't go back. Thanks for the comment. Hi John, both version of the soda bread look delicious. The texture look so soft and I like the ideas baked in the pan. Perfect pictures. Hi Amelia, two slices coming up! I take my coffee black, thanks. ;-) You have a great week too, and thanks for the comment. Wow your soda bread looks beautiful! Every year my Irish neighbor stop by to give us soda bread. It's been the tradition! I would love to make next year and surprise them. Your recipe is a keeper! Hi Nami, this is really good stuff (both recipes). Have fun making it! Thanks for the comment. Hi Christine, it is nice making one's own bread - we even make our own sandwich bread. But this one is particularly nice! Thanks for the kind words, and the comment. Excellent! I used to have a recipe for Irish soda bread that I loved, lost it and haven't liked the other versions that I've tried at all as much. The recipe I used to have made a loaf with more texture like your 'simple' recipe, that gives me the hint that it's closer to the soda bread that I like. Good hint to use buttermilk from making your own butter, I will have to try that sometime! I also like some coarse sugar sprinkled on the top of the loaf before baking it, have no idea if it's traditional but it's good. Hi Mary, you really should try making your own butter sometime, if for no other reason than to get the buttermilk. It's wonderful! I like the idea of sprinkling sugar on top. Probably not traditional, but who cares? ;-) Thanks for your comment.